"Red Indianfish seem to prefer northern sides of the entrances to bays and harbours"
This trip was done with members of the Georges River Recreation and Off-road Club (GROC). There were three other vehicles. I travelled with my friend Frank Cahill (I had not met Kelly at this time). My car was my 1999 Toyota Landcruiser Prado V6 3.4 litre petrol (see more detail page). I had an extra spare, almost 70 litres of water and 22 litres of extra petrol. I had put brand new B. F. Goodrich All-terrain tyres on the car a few weeks before leaving. Our tent was a pyramid tent. The car was very full. Frank and I left Sydney early and travelled via the F4 to the Blue Mountains and then via the Great Western Highway to Dubbo. The others are going via Walgett abd Bourke and we are meeting up with them on Monday 14 July in Milparinka or Tibooburra. We stop and have morning tea at a very poor spot (where it was almost sleeting) and then continued on. We refuelled at Dubbo. It rained from before Lithgow to past Dubbo. We had lunch at Narromine at a nice picnic area in the town. 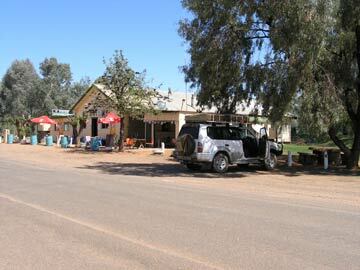 We then continued on to Cobar where we again refuelled. We hit the first dirt about 36 km out as we headed to Louth. 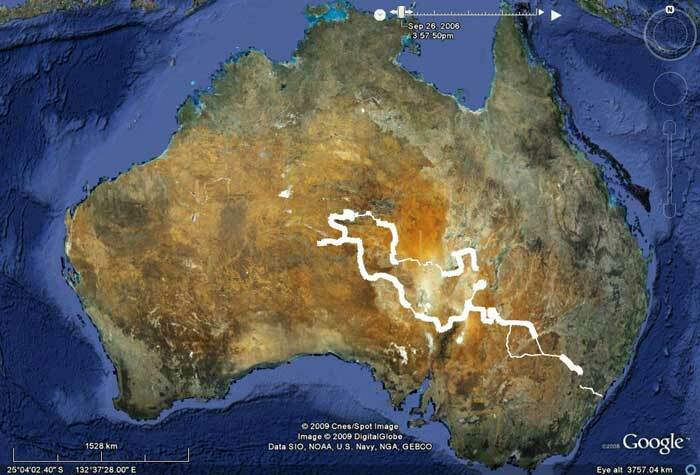 We would not see tar (apart from a short section in Birdsville), for almost 3,500 kilometres till we got to Alice Springs 13 days later. We counted 20 kangaroos in first 25 km or so but they never moved from where they were. We figured they were used to cars passing. There were lots of goats, as well as earlier on the road from Nyngan to Cobar. The road very good then fair. 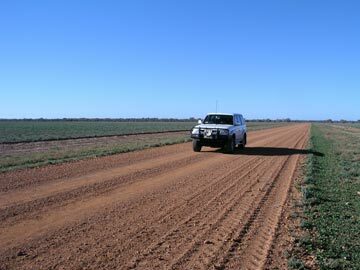 In the later sections it was better in the drains till we entered Bourke Shire and then very good. 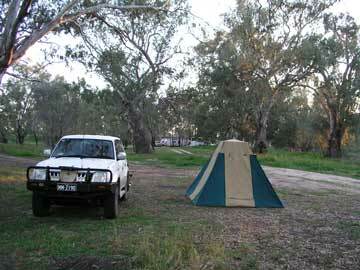 We arrived at Louth about 5 pm and found a good camping spot on the western side of the Darling River. There is also a good spot on the eastern side north of the bridge. We went to the Louth Hotel (on the eastern side of river) and had four middies (tap - $2.40). We met Tony Windsor, the Federal Member for Tamworth, Graham who works for him, Tim his son and an old bloke. Not a bad bloke, he was camped just down from us. We went back to the camp and had a casserole with potatoes and carrots. We shared a camp fire with the people next door from Port Augusta, SA. I took a few photos of the river then we had breakfast. After this walked over to the pub and took some shots of the river and then the pub with sun on it. We left Louth and went via Wanaaring. The road was pretty good most of the way to the Bourke/Wanaaring Road, but on a couple of spots we had to drop to 80 kmh. We mostly sat on 95 kmh till Mount Wood. We had morning tea at about 11:21 am beside a section of the Paroo River just west of Wanaaring. We left at 11:42 am. West of Wanaaring there is a new section of road that deviates to the south around the Bulloo River Overflow which was flooded when I came this way back in 1978. Just after getting back on the main (old) road, we stopped at 1:25 pm at the Clifton Bore and had lunch. There were flies galore, they almost carried us away. The bore has very hot water, not flowing out directly, but into other spots nearby. We left at 1:54 pm. We arrived at the Mt Wood/Tibooburra turnoff and found that the road to Milparinka is closed and looks unused for a long time. There is no way that Les and the others will be going to Milparinka tomorrow where we have arranged to meet. We arrived at Mount Wood Homestead in Sturt National Park at 2:45 pm and I went to the Homestead but the Acting National Parks Area Manager, Ingrid Witte, was not there. 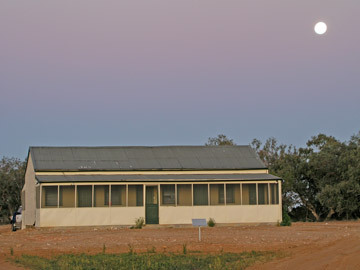 We went to the Shearers Quarters which I had arranged to use and put our stuff in two of the rooms. From here we went the short distance to the Pastoral Museum. 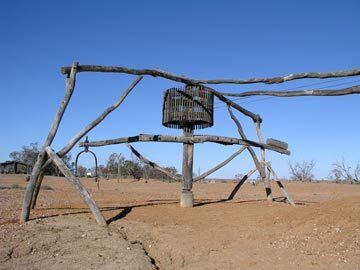 The outdoor museum was set up in the 1970s by the then Superintendent (as the position was then called) of the Tibooburra Region, John Gerritsen. 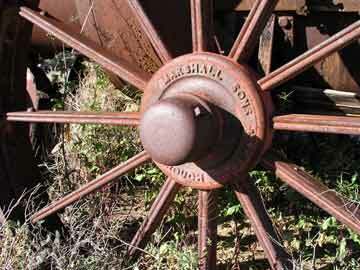 It has a lot of original machinery set up with reconstructions of other items to show what would have been involved in running a property in the remote location in the late 1800s and early 1900s. It is looking a bit tired now and needs some work to ensure that it lasts another 30 years or more. 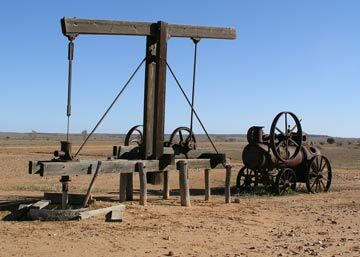 There is a portable steam engine here which is set up to power a water pump. The engine was built by Marshall, Sons & Co Limited Gainsborough England at its Britannia Iron Works. I am researching it to find out more, may have to wait till after August 2010 when I will be visiting again and I can get some more information from the engine as to the serial number. 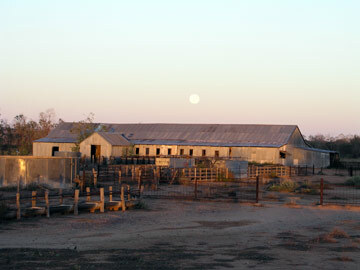 From here we went to the Mount Wood Shearing Shed which is in very good condition. We then moved to the Camping Area to have a look. It is well set out and in good condition but in the peak of Summer it would be very hot. Back at the Shearer's Quarters, we had hot showers and then a cuppa. If you have a large group, this would be a good place to stay. Some South Australians who drop by tell us that the road from Camerons Corner to Merty Merty and then on to Innaminka is closed (according to HF radio). The sun was setting and we took some photos of the sunset and moon. We then then cooked dinner in the kitchen (chicken and veges). Maximum daytime temperature about 18C. For the next part of this trip, click here.